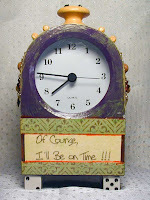 I received an Etsy order this morning for the On-Time Clock. I made this a good year or so back and listed on Etsy a couple months back. I have a couple different places I put pieces when they've been listed and found myself going back and forth between them this morning trying to find just where I put this little clock, in the middle of which, I had bad thoughts about a teenager taking it away and such as that .... but in the end, found it hiding behind a small stack of crosses. For next years Resolution I'm, once again, going to resolve to become a bit more organized. (Ya right). Fond farewell little clock ... hope you'll be loved at your new home.